Posted in: Historia y estudios culturales de las emociones. Tagged: Penelope Lee and Jessica Scott as part of the Education and Outreach Program, This Question of the History of Emotions, “What does the History of Emotions mean to you?”. Over 14 interviews with visiting researchers were recorded at the Melbourne node of the ARC Centre of Excellence for the History of Emotions over the course of 2012-2013. Each person was asked: “What does the History of Emotions mean to you?”. A compilation of their answers follows. These interviews were conducted by Penelope Lee and Jessica Scott as part of the Education and Outreach Program. Posted in: Avisos, Convocatorias, Te recomendamos. Tagged: anthropology, history, ISRE 2015, linguistics, neuroscience, philosophy, psychology, Research on Emotion, sociology, study of emotion. 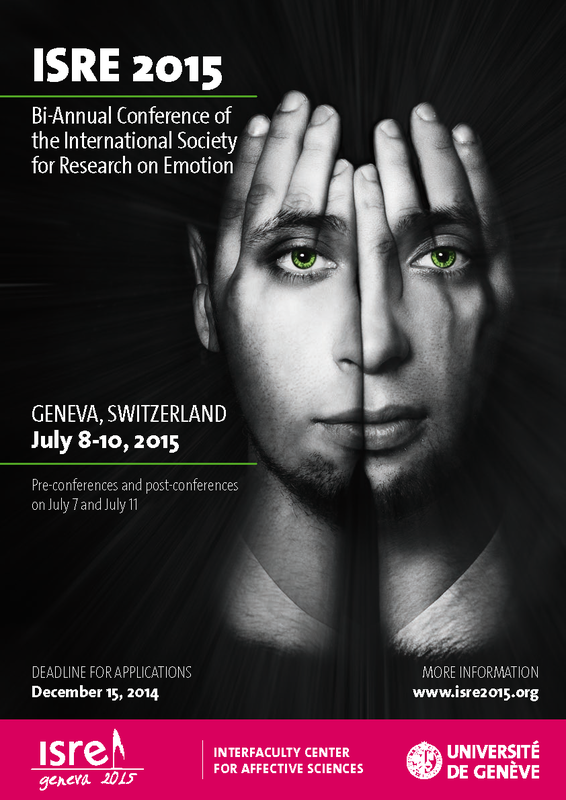 The 2015 conference of the International Society for Research on Emotion (ISRE 2015) will take place on July 8-10, 2015 at the University of Geneva organized by the Swiss Center for Affective Sciences. Pre- and post-conference events are also possible on July 7th and 11th, respectively. Over the years, the ISRE conferences have become a reference occasion for all the disciplines involved in the study of emotion to meet and share the results of their work. Submissions are welcome from scholars in all disciplines working on topics relating to emotion, including psychology, neuroscience, philosophy, sociology, linguistics, affective computing, history, anthropology and the humanities and social sciences generally. The scientific program comprises plenary keynote lectures, symposia, individual talks and posters. Abstracts can be submitted on our website until December 15th. You are invited to consult the submission guidelines on our site before preparing a submission.